Mark Reynolds took a fastball from Nationals relief pitcher Collin Balester off the helmet in the bottom of the sixth inning of the D-backs’ game Tuesday. He got up on his own after being on the ground for about a minute, but was removed from the game. 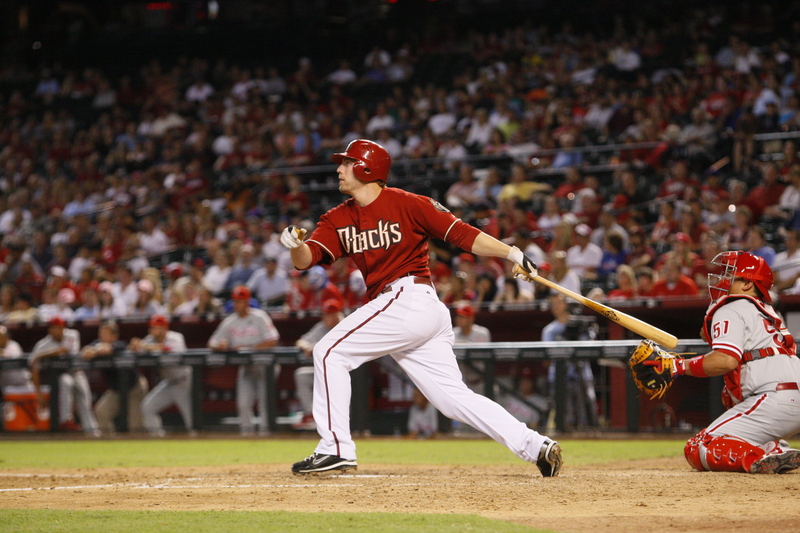 Today is Reynolds’ 27th birthday, which was notable when he homered to give the D-backs a 4-1 lead in the fourth. We definitely hope Reynolds is OK. Will post an update as soon as we have word from the team medical staff. Reynolds is back in the dugout, and seems OK (with the exception of an ugly gash on the left side of his head). The initial neurological exam was fine, but he’ll be reevaluated further later tonight. Mark Reynolds and the D-backs agreed to a contract extension this week for three years and an option for a fourth, allowing the club to buy out a pair of arbitration years and possibly a year of free agency if the D-backs exercise the option. Reynolds is yet another good, young player signed to a multi-year deal for the D-backs this offseason. He joined Justin Upton, who signed a deal two weeks ago, and Edwin Jackson who signed a deal back in February. Here’s a little statistical fun for you. These are six players in their Age 25 season. The most recent is Reynolds, obviously. These players weren’t chosen at random. These are all guys who are sometimes derisively deemed “high-strikeout” players, but they’re all significant offensive contributors to their teams. For comparison’s sake, this is what the counting stats for “Player Y” would be if multiplied by 1.8 to reach 158 games (40 HR, 31 2B, 180 SO). The names will be listed at the end of this blog. To add another layer, Reynolds has more positional value than all but one of these players. Reynolds and “Player W” are both third baseman, while four are outfielders, one is a first baseman. Only one of them, an outfielder, is even considered an above-average or better defensive player. Reynolds gives the D-backs some significant punch in the middle of the lineup, but it’s made even more valuable when you consider the position scarcity. Finding an outfielder who can hit 40-plus home runs is easier to do than finding a third baseman who can do the same. And by playing third, Reynolds gives the D-backs the ability to use those outfield positions to find more offensive contributors. Third base is one of the more offensively scarce positions in baseball, along with second base, right behind shortstop and catcher. In 2009, National League third basemen posted a cumulative .756 OPS, approximately 70 points lower than Reynolds. The average NL third baseman in 2009 had 20 home runs, 31 doubles, 83 runs and 83 RBI, all well below Reynolds’ totals (44/30/98/102). It’s tough to say where Reynolds’ career trajectory will go, but it’s worth noting that every player (except Reynolds… for now) on the above list is an All-Star, and the two older ones are in the Hall of Fame. ReynoldsBP from D-backs Insider on Vimeo.